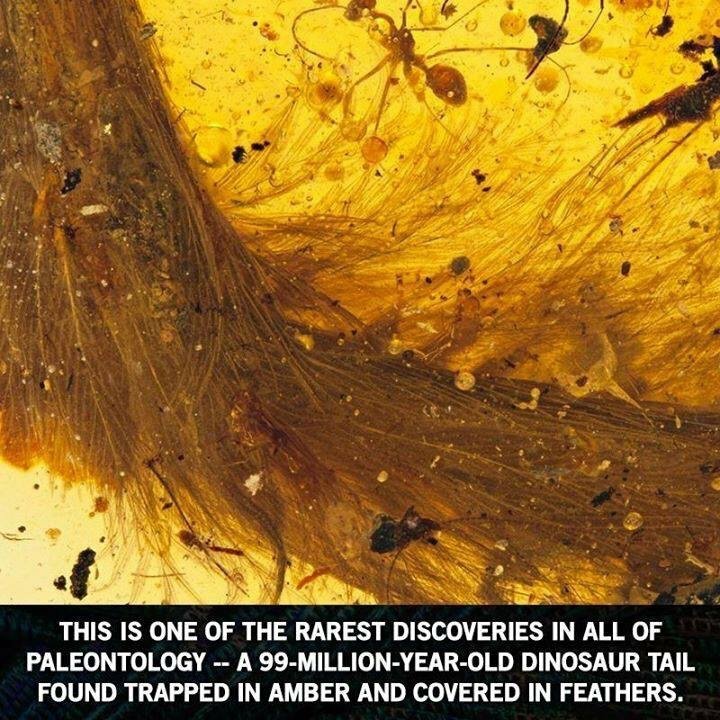 When did Dinosaurs get feathers? Re: When did Dinosaurs get feathers? 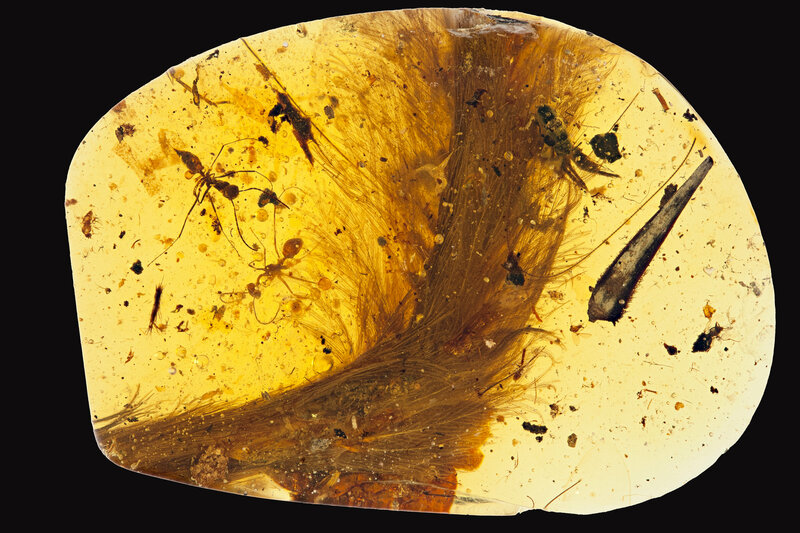 Scientists Discover a Dinosaur Tail Preserved in Amber: The amber sample showcased the delicate feathers of a tiny dinosaur. My daughter was watching a show on PBS called, "Dinosaur Train". It is usually a fun show. Well today, the little dinosaurs were on the hunt, looking for the dinosaur that belonged to the feathers they found. Well, they found a velicaraptor who had feathers and was showing them how colorful they were. Really? When did this happen? Have scientist found fosilized feathers? 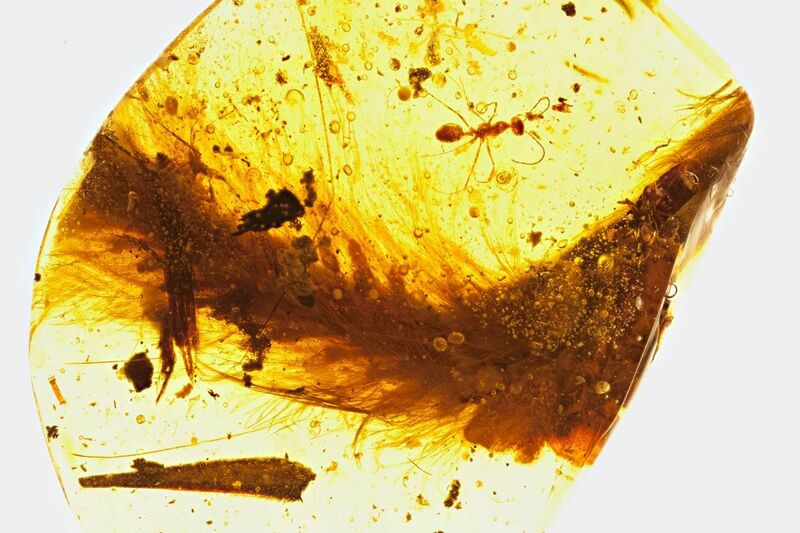 Have they found dinosaur feathers perfectly preserved, showing their colors? I have never seen such proof, not saying it doesn't exist. I think what gets me is, I watch shows on dinosaurs, and they tell you how they hunted, acted, mated, and lived. And they conclude all this from bones, and not documenting a real live dinosaur. Something stinks in subarbia. It just seems they are making up "facts" to prove their theory's. 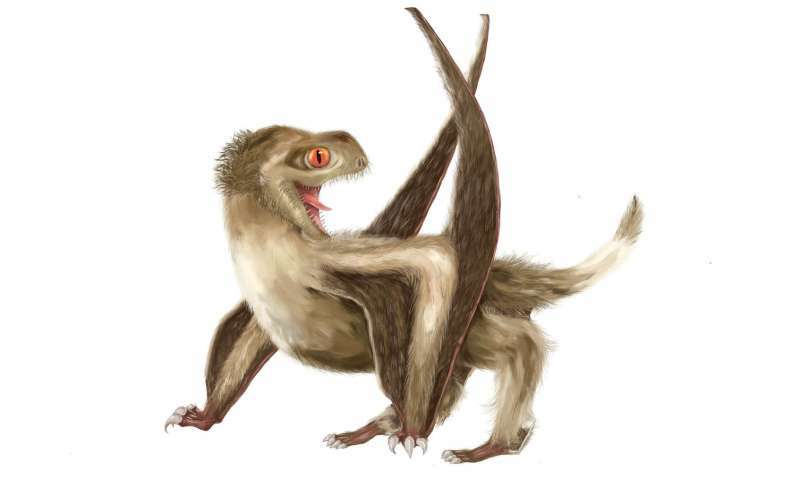 Evolutionists want dinosaurs to have feathers because it fits into their theory that 'Dinosaurs evolved into birds'. Until there are actual evidence for feathers found I'll continue to rail against this. I'm not just talking about fossilized bird creatures either. If they want to put feathers on raptors and other large dinosaurs then they need to have substantial evidence before it is taught as fact. tuttle wrote: darth, I assume you have missed the 'banter' twixt infidel and I on this matter? tuttle wrote: Until there are actual evidence for feathers found I'll continue to rail against this. Somehow I think you'll continue to rail against it no matter what. So I have been watching over 7 years. It has been fascinating. Thank you all! I'm a little slow. What's SD? I don't even know what you're getting at. I think you play games in your head sometimes. What else could be the point of bringing up the same story in the same thread two years later after we've already talked it to death? Simple: To compare responses then with responses now. For instance, last time the evidence was equivocated away for the sake of the creationist position. This time, the response was simply an implied ad hominem. So, this particular thread has run its course (for hypothesis 1, anyway). Oh no. It's the written record that matters. *soft science is more survey related, etc. And I have noticed that saying "soft" vs. "hard" science becomes a debate topic--- it's meant as a gentle jab in this post. Ok. This thread reached its zenith on page 52. You’re welcome. The rainbow of hues seen in modern bird eggs probably evolved in birds' dinosaur ancestors, which had eggs with colorful and speckled shells. That's according to a new study of fossil eggs in the journal Nature. Researchers found that birds' close dinosaur relatives had eggs with traces of two pigments—a red-brown one and a blue-green one. This same pair of pigments mixes and matches in today's bird eggs to produce colors ranging from robin's egg blue to red to yellow to green. "There is a huge diversity in egg color and pattern. For a long, long time people have assumed that egg color is a trait that is unique to our modern birds," says Jasmina Wiemann, a paleontologist at Yale University. She says that assumption was based on the fact that birds' closest living relative, the crocodiles, "have completely uncolored, unpigmented eggs." Iridescence is responsible for some of the most striking visual displays in the animal kingdom. Now, thanks to a new study of feathers from almost 100 modern bird species, scientists have gained new insights into how this colour diversity evolved.